Clusters of stars. The number of constellations named in the Biblical writings is small. In view of the extensive astronomical attainments of the Assyro-Babylonians, it is safe to predicate of the Hebrews larger knowledge of the starry heavens (compare Ps. viii.) 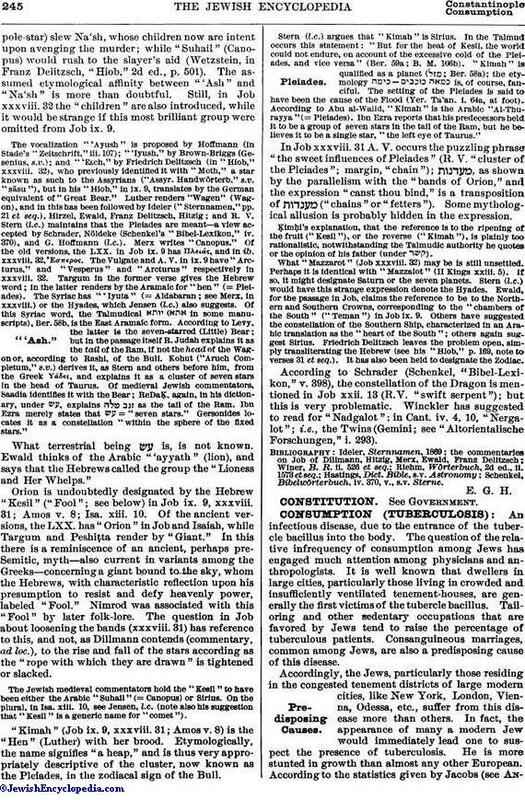 than appears from references actually embodied in Biblical literature; and there is no necessity for accepting Stern's explanation that only such celestial bodies were regarded with interest by the Hebrews as were of importance for calendric purposes in ushering in the seasons (Stern, in Geiger's "Jüd. Zeit." iii. 258; Friedrich Delitzsch, "Hiob," p. 169; see also Astronomy). "'Ash" or "'Ayish" is mentioned twice in Job (ix. 9, xxxviii. 32, R. V.), and has been identified with the Great Bear, though this identification has been rejected by many Biblical scholars. The Arabs certainly knew this brilliant cluster of stars by the name of "Na'sh" (the Bier); and the three stars in the tail they designated as "Banat Na'sh" (the Daughters of the Bier); i.e., the "followers," an appellation still in vogue in modern Syria. A legend is connected therewith, according to which Gedi (thepole-star) slew Na'sh, whose children now are intent upon avenging the murder; while "Suhail" (Canopus) would rush to the slayer's aid (Wetzstein, in Franz Delitzsch, "Hiob," 2d ed., p. 501). The assumed etymological affinity between "'Ash" and "Na'sh" is more than doubtful. Still, in Job xxxviii. 32 the "children" are also introduced, while it would be strange if this most brilliant group were omitted from Job ix. 9. The vocalization "'Ayush" is proposed by Hoffmann (in Stade's "Zeitschrift," iii. 107); "'Iyush," by Brown-Briggs (Gesenius, s.v. ); and "'Esch," by Friedrich Delitzsch (in "Hiob," xxxviii. 32), who previously identified it with "Moth," a star known as such to the Assyrians ("Assyr. Handwörterb." s.v. "săsu"), but in his "Hiob," in ix. 9, translates by the German equivalent of "Great Bear." Luther renders "Wagen" (Wagon), and in this has been followed by Ideler ("Sternnamen," pp. 21 et seq. ), Hirzel, Ewald, Franz Delitzsch, Hitzig; and R. V. Stern (l.c.) maintains that the Pleiades are meant—a view accepted by Schrader, Nöldeke (Schenkel's "Bibel-Lexikon," iv. 370), and G. Hoffmann (l.c.). Merx writes "Canopus." Of the old versions, the LXX. in Job ix. 9 has Πλειάς, and in ib. xxxviii. 32, Ἕσπερος. The Vulgate and A. V. in ix. 9 have "Arcturus," and "Vesperus" and "Arcturus" respectively in xxxviii. 32. Targum in the former verse gives the Hebrew word; in the latter renders by the Aramaic for "hen" (=Pleiades). The Syriac has "'Iyuta" (= Aldabaran; see Merx, in xxxviii.) or the Hyades, which Jensen (l.c.) also suggests. Of this Syriac word, the Talmudical in some manuscripts), Ber. 58b, is the East Aramaic form. According to Levy, the latter is the seven-starred (Little) Bear; but in the passage itself R. Judah explains it as the tail of the Ram, if not the head of the Wagon or, according to Rashi, of the Bull. Kohut ("Aruch Completum," s.v.) derives it, as Stern and others before him, from the Greek ϒάδες, and explains it as a cluster of seven stars in the head of Taurus. Of medieval Jewish commentators, Saadia identifies it with the Bear; ReDaḲ, again, in his dictionary, under , explains as the tail of the Ram. Ibn Ezra merely states that = "seven stars." Gersonides locates it as a constellation "within the sphere of the fixed stars." What terrestrial being is, is not known. Ewald thinks of the Arabic "'ayyath" (lion), and says that the Hebrews called the group the "Lioness and Her Whelps." Orion is undoubtedly designated by the Hebrew "Kesil" ("Fool"; see below) in Job ix. 9, xxxviii. 31; Amos v. 8; Isa. xiii. 10. Of the ancient versions, the LXX. has "Orion" in Job and Isaiah, while Targum and Peshiṭta render by "Giant." In this there is a reminiscence of an ancient, perhaps pre-Semitic, myth—also current in variants among the Greeks—concerning a giant bound to the sky, whom the Hebrews, with characteristic reflection upon his presumption to resist and defy heavenly power, labeled "Fool." Nimrod was associated with this "Fool" by later folk-lore. The question in Job about loosening the bands (xxxviii. 31) has reference to this, and not, as Dillmann contends (commentary, ad loc. ), to the rise and fall of the stars according as the "rope with which they are drawn" is tightened or slacked. 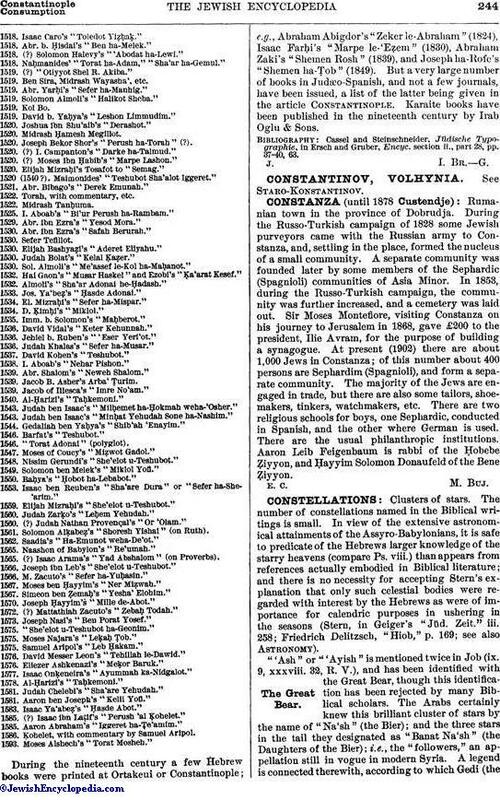 The Jewish medieval commentators hold the "Kesil" to have been either the Arabic "Suhail" (= Canopus) or Sirius. On the plural, in Isa. xiii. 10, see Jensen, l.c. (note also his suggestion that "Kesil" is a generic name for "comet"). "Kimah" (Job ix. 9, xxxviii. 31; Amos v. 8) is the "Hen" (Luther) with her brood. Etymologically, the name signifies "a heap," and is thus very appropriately descriptive of the cluster, now known as the Pleiades, in the zodiacal sign of the Bull. Stern (l.c.) argues that "Kimah" is Sirius. In the Talmud occurs this statement: "But for the heat of Kesil, the world could not endure, on account of the excessive cold of the Pleiades, and vice versa" (Ber. 59a; B. M. 106b). "Kimah" is qualified as a planet ( ; Ber. 58a); the etymology is, of course, fanciful. The setting of the Pleiades is said to have been the cause of the Flood (Yer. Ta'an. i. 64a, at foot). According to Abu al-Walid, "Kimah" is the Arabic "Al-Thurayya" (= Pleiades). Ibn Ezra reports that his predecessors held it to be a group of seven stars in the tail of the Ram, but he believes it to be a single star, "the left eye of Taurus." In Job xxxviii. 31 A. V. occurs the puzzling phrase "the sweet influences of Pleiades" (R. V. "cluster of the Pleiades"; margin, "chain"); , as shown by the parallelism with the "bands of Orion," and the expression "canst thou bind," is a transposition of ("chains" or "fetters"). Some mythological allusion is probably hidden in the expression. Ḳimḥi's explanation, that the reference is to the ripening of the fruit ("Kesil"), or the reverse ("Kimah"), is plainly too rationalistic, notwithstanding the Talmudic authority he quotes or the opinion of his father (under ). What "Mazzarot" (Job xxxviii. 32) may be is still unsettled. Perhaps it is identical with "Mazzalot" (II Kings xxiii. 5). If so, it might designate Saturn or the seven planets. Stern (l.c.) would have this strange expression denote the Hyades. Ewald, for the passage in Job, claims the reference to be to the Northern and Southern Crowns, corresponding to the "chambers of the South" ("Teman") in Job ix. 9. Others have suggested the constellation of the Southern Ship, characterized in an Arabic translation as the "heart of the South"; others again suggest Sirius. Friedrich Delitzsch leaves the problem open, simply transliterating the Hebrew (see his "Hiob," p. 169, note to verses 31 et seq.). It has also been held to designate the Zodiac. According to Schrader (Schenkel, "Bibel-Lexikon," v. 398), the constellation of the Dragon is mentioned in Job xxii. 13 (R. V. "swift serpent"); but this is very problematic. Winckler has suggested to read for "Nadgalot"; in Cant. iv. 4, 10, "Nergalot"; i.e., the Twins (Gemini; see "Altorientalische, Forschungen," i. 293). Schenkel, Bibelwörterbuch, iv. 370, v., s.v. Sterne.